Book Ivo Daalder as a keynote speaker. Ivo H. Daalder served as US ambassador to NATO from 2009 to 2013. He is currently President of the Chicago Council on Global Affairs. For more information on Geopolitics speaker Ivo Daalder, contact VBQ Speakers founding agent Leo von Bülow-Quirk on leo@vbqspeakers.com or 0044 7833 727090. Ivo H. Daalder served as US ambassador to NATO from 2009 to 2013. He is currently President of the Chicago Council on Global Affairs, an independent, nonpartisan membership organisation focusing on critical global issues. Prior to his appointment as ambassador to NATO by President Obama, Daalder was a senior fellow in foreign policy studies at the Brookings Institution, specialising in American foreign policy, European security and transatlantic relations, and national security affairs. Before joining Brookings in 1998, he was an associate professor at the University of Maryland’s School of Public Policy and director of research at its Center for International and Security Studies. He also served as director for European affairs on President Bill Clinton’s National Security Council staff from 1995-97. 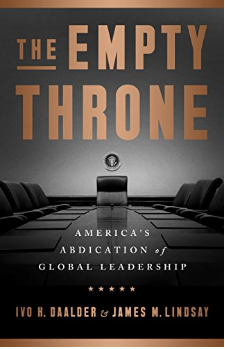 Ambassador Daalder is the author and editor of 10 books, including most recently The Empty Throne: America's Abdication of Global Leadership (2018, with James M. Lindsay). Other books include In the Shadow of the Oval Office: Profiles of the National Security Advisers and the Presidents they Served — From JFK to George W. Bush (2008, with I. M. Destler) and the award-winning America Unbound: The Bush Revolution in Foreign Policy (2005, with James M. Lindsay). Daalder is a frequent contributor to the opinion pages of the world’s leading newspapers, and a regular commentator on international affairs on television and radio. Ambassador Daalder is a highly respected figure in the US foreign policy community who has held diplomatic office at the highest level. He is perfectly placed to analyse the impact of Trump’s foreign policy on the international order, the future of NATO, and US relations with Russia, China, Iran and North Korea.